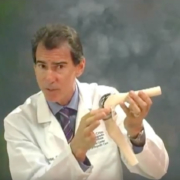 In the first of two blog posts focusing on computer assisted total knee replacement surgery (TKR), I will discuss the physiology of the knee joint, how it works, what causes its breakdown and the possible need for a TKR. Orthopedic surgeons generally categorize the knee joint as having three compartments: the inside (medial compartment), the outside (lateral compartment) and the front (patella femoral compartment). What many people don’t realize is the knee is much more than a large hinge joint. Not only does the knee extend and flex, it also pivots around the medial compartment as it moves and the cruciate ligaments help direct this movement. In a normal, well-functioning knee, the knee’s alignment ensures that weight bearing forces are distributed equally between the medial and lateral compartments of the joint. This is referred to as a neutral mechanical axis. Imagine holding a carpenter’s plumb line (a string with a weight on one end so it falls in a straight line due to the pull of gravity) directly over the middle of the hip joint (which is the center of the femoral head) and allowing it to fall over the middle of the ankle. In a normal knee with a neutral mechanical axis, the string crosses the middle of the knee joint. 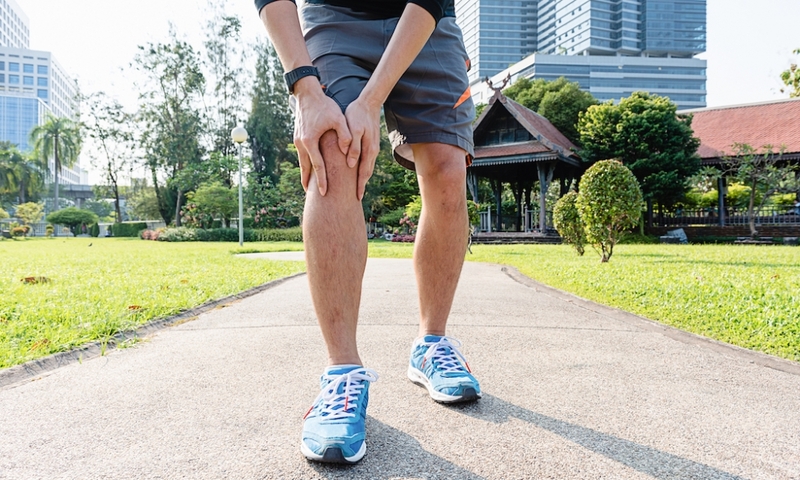 When a knee degenerates, often it develops an angular deformity, either bowlegged or knock-kneed. The string then doesn’t pass through the middle of the knee but rather to the side and the angular eccentric forces cause the knee deformity to worsen with time. The knee has a wonderfully complex soft tissue sleeve, which stabilizes and balances it throughout the normal range of motion. In a normal knee, the tension on these tissues is distributed equally. The anterior and posterior cruciate ligaments (ACL and PCL) help guide this precise movement (called kinematics) during extension and flexion. The specialized cartilage that covers the bones in the knee joint is called hyaline cartilage. This cartilage miraculously minimizes friction as it distributes the joint reactive forces. Cartilage does not have a blood supply and when damaged heals very slowly. When hyaline cartilage is damaged, the body replaces the damaged cartilage with fibrocartilage, not hyaline cartilage. Fibrocartilage does not have the same mechanical properties as hyaline cartilage and unfortunately, this sets the stage for progressive degeneration and osteoarthritis, the most common cause for TKR surgery. As the knee cartilage breaks down, forces are concentrated focally on a smaller area of bone, rather than distributed over a larger surface. The over-stressed area of bone becomes denser (it looks white or “sclerotic” on an x-ray) and bone spurs develop. Some believe the formation of bone spurs is a physiologic attempt by the body to redistribute the forces over a broader area. When cartilage is injured and breaks down on one side of the joint, the space between the bones decreases and the joint no longer is aligned. Weight bearing forces progressively make the deformity worse, which causes pain and inflammation. The synovial fluid in the knee joint nurtures the cartilage. When the joint is inflamed, the lining of the joint secretes more synovial fluid. This can make the knee feel tight and swollen, often described as having “water on the knee.” With the lack of, or breakdown of cartilage, this increased amount of fluid, now under pressure, can get squeezed into small crevices of the bone, which creates a balloon-like hole called a degenerative cyst or geode. It also can cause a cyst to form as the synovial fluid pushes against a weakened area of the knee capsule and the capsule balloons outward. A cyst that forms in the back of the knee is called a Baker’s Cyst. 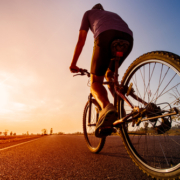 With time and progression of the degenerative process, the perfectly smooth surfaces of the knee bones are lost, areas of the bone collapse and the joint breakdown worsens. With the loss of normal alignment, the patella no longer tracks centrally over the femur causing pain and additional degeneration. The most common area where symptomatic degeneration begins is in the medial compartment. Although the arthritic process typically starts in one compartment, with time it progresses to the other compartments. If a patient has degeneration in only one compartment, a partial knee replacement can be a very effective way to resurface the worn-out compartment that is causing pain. The hope is that a partial knee replacement will stop the arthritic progression. 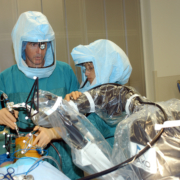 If appropriate, this procedure requires much less dissection, results in a faster recovery and many patients report that it feels like a normal knee. For patients who do require TKR, I choose the implant that is best suited to each person’s medical and lifestyle needs. 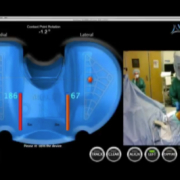 Implants are individualized for each patient’s unique anatomy and precisely implanted using computer assisted navigation and robotic techniques. 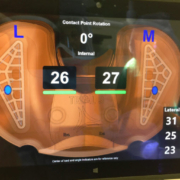 In my next blog I will discuss how computer assisted TKR surgery has revolutionized the reconstruction of knee joints, providing surgeons with ability to more accurately restore knee functionality and pain-free quality of life for patients.